Rubber stamping is a great craft! While naturally artistic people can use their talents to produce wonderful results, even people without an ounce of artistic spirit can create great looking things with just a rubber stamp or two. So if you have thought that you could never create a handmade card or embellish a scrapbook page, it's time to think again! Rubber Stamping - A Craft For Creatives and Non-Creatives Alike! If you are not at all artistic or creative but would love to have a go at creating a greeting card, customizing items such as gift bags or even making your own ornaments or decorations, why not consider rubber stamping? This is a craft that is extremely accessible. Very little in the way of specialist equipment is required to get started, and effective results can be achieved with the minimum of knowledge. Unlike many other crafts that can take years to master, many people are delighted with the results that they can achieve with rubber stamps almost immediately. If you want to develop the craft, these basic skills can be built upon over time or if you simply enjoy the almost instant gratification of replicating great images quickly and simply then just keep to the basics! Take a look at What is Rubber Stamping for more information about the craft. Even the most artistically or creatively challenged person can put stamp to paper and produce the beginnings of a great handmade greeting card. Add a sticker or two with a sentiment or greeting and attach an embellishment and voila – your first handmade card! 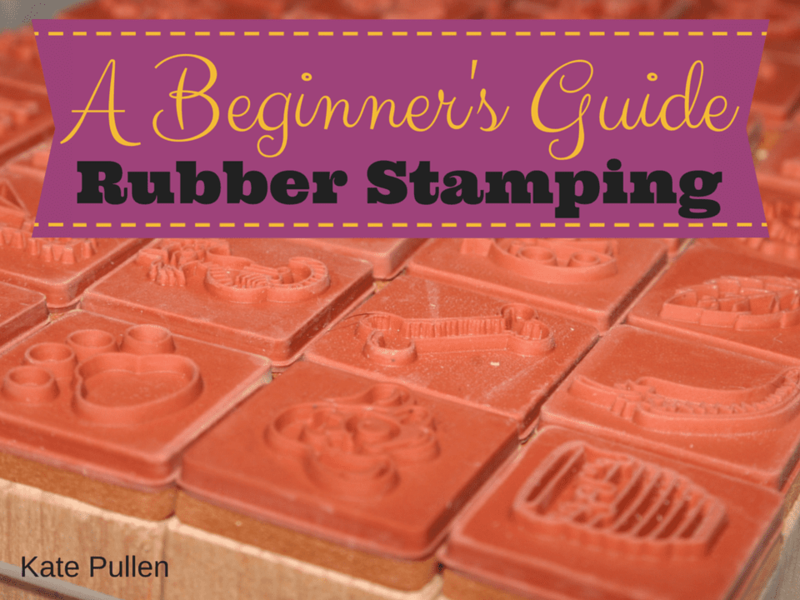 Read on for more information about how to get started rubber stamping. Pick a few rubber stamps with general images to start. But, hang on, when we say rubber stamps do we mean just that - stamps made from rubber? Nowadays stamps can be made from a variety of materials and you'll even find digital stamps (digital images which you can color - stamps without the stamping). You'll find we have a lot of free digital stamps here which you can download and practice with. All that is required to get started stamping is a rubber stamp, some ink, paper or cardstock and perhaps something to add color to the image such as pens or paints. Find out more about the different supplies you require to start rubber stamping. A beginner stamper only requires a few pieces of basic equipment are required to produce great results. Start off with the essentials, such as a pair of scissors, craft knife and cutting board and other pieces of more specialized equipment can be purchased later as required. If you have never crafted before and you are convinced that you are not at all creative, then a great place to start is with a handmade greeting card. Everybody appreciates a handmade card and even the most simple of cards can draw admiring comments. And of course, making your own greeting cards can save you a ton of money over the course of a year. For more information about making cards, including tips for buying supplies, take a look at Making Handmade Cards with Rubber Stamps. One of the great things about rubber stamping is that it works on so many levels! There are some fantastic rubber stamping artists who produce wonderful works of art with their stamps, that are full of detail and intricately formed. While at the other end of the scale there are stampers who simply use rubber stamps to customize a greeting card or add a personal touch to a shop bought item. If you are happy to keep your stamping simple then great – there is nothing wrong with that! Books can be a great source of information and inspiration. See Five Books for Beginner Rubber Stampers for recommended reading. Assuming that this is your first foray into crafting, here are some tips that will help you through the sometimes confusing selection of exciting crafting products. Stamps: Pick a mounted rubber stamp for your very first project. These are the traditional rubber stamps that are mounted onto a block of wood. This will save you having to worry about mounting an unmounted stamp or having to buy an acrylic block. While these are a little more expensive, if you are buying one single stamp to give stamping a try, this will be worth the small additional expense. Choose simple and bold images to start. See Types of Rubber Stamp and Tips for Buying Your First Stamps for further information about buying rubber stamps. Ink: Inks are available in a wide spectrum of colors! There are also many different types – some are fast drying, others are slow drying or need special care. Pick a dark dye ink to start. These are quick drying and you don't need any special equipment or cleaner to work with them. Paper or Cardstock: You can stamp on almost anything! A supply of waste paper will be ideal for practicing. Computer paper is fine for some projects and cardstock is best for making handmade cards. Greeting card blanks that are basically blank greeting cards that are cut to size and ready to decorate can be a great way to start. Color: If you have some marker pens around the house then these can be useful for adding color to stamped images. There is no need to buy expensive paints or pencils yet! Practice first with what you have available before deciding on further purchases. See Add Color to Rubber Stamping Projects for more information.